The national anthem of Pakistan. 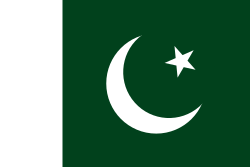 The Islamic Republic of Pakistan (پاکستان in Urdu), or Pakistan, is a country located in South Asia that was formed on 14 August 1947 from the previous country known as "British India". Pakistan borders India, Iran, Afghanistan, China and the Arabian Sea. With just under 160 million inhabitants it is the sixth most populous country in the world. It is the second largest Muslim country in the world, after Indonesia but India is home to more Muslims than Pakistan. Hindus, Buddhists, Sikhs, and Christians in Pakistan also celebrate their own festivals and holidays. Sikhs come from across the world to visit several holy sites in Punjab, including the shrine of Guru Nanak, the founder of Sikhism, at Hassan Abdal in the Attock District, and his birthplace, at Nankana Sahib. Many other important early historical Sikh shrines are found in Pakistan. Many thousands of Sikhs from all parts of the world visit Pakistan every year to pay homage to these sacred shrines. Local Pakistani community is very welcoming to these pilgrims. There are also several regional and local festivals, such as the Punjabi festival of Basant, which marks the start of spring and is celebrated by kite flying. Pakistan Timeline: A chronology of key events. This page uses content from the English Sikhi Wiki. The original article was at Pakistan. The list of authors can be seen in the page history. As with the Religion-wiki, the text of Sikhi Wiki is available under the GNU Free Documentation License.